Alright y'all, I'm giving you an 8 day heads-up on this event so you have time to plan. Now, when I say plan I'm talking plan a ride, plan your meals, plan your kids and plan your wife 'cause we plannin' errybody down at Stubb's Saturday March 5th! Our friends over at Knuckle Rumbler are joining forces with Proper Entertainment to bring a fun and unique Mardi Gras experience to Austin. We're talking music, Crawfish, Carribean food and even the folks from Frank will be on hand. The music will fill both the inside and outside stages for 14 hours of craziness starting at noon. Tickets for all of this madness are $10 if you buy them now but starting Monday February 28th the price goes up to $12 and if you procrastinate until the day of the event you'll be paying $15. So, I suggest you click that link now if you want to get your creole on next Saturday. Budos Band will be headlining but, like I said, there will be 14 hours worth of music ranging from DJ's, to live bands with all variations of New Orleans music in the mix. I've got the full line-up posted after the jump. Oh, and this event is ALL AGES so you can bring that under-age girl you're dating. Yeah, I got your number (and so does Chris Hansen). 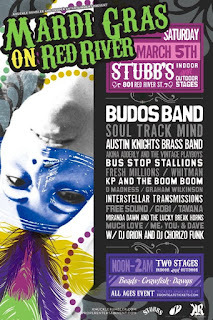 So, there you have it folks, Austin's own version of Mardi Gras next Saturday taking over both stages at Stubb's with booze, beeds, food and music. Bring your friends and family all ages are welcome, in face kids under 10 get in for free! Oh, and don't forget the sooner you get Tickets the less expensive they'll be.